Depression comes in many forms. Sometimes, it’s a short-term condition as a result of recent loss or trauma. But for many people, depression is a lifelong battle that comes and goes. Most of us probably know a friend, family member, co-worker, or neighbor that has struggled with the weight of depression. Perhaps we have struggled with depression ourselves. Here are eight ways we can help a friend (or anyone in our lives) who is dealing with depression. This is probably the most important thing you can do! Many times, people with depression feel like a burden to those around them. Because of this, they may not come to you directly if they’re struggling. Try to be as supportive as possible during this time. Offering a judgment-free listening ear, even if they’re not ready to open up at the time, can be a lifeline for someone with depression. Sympathy is hearing someone’s problem and saying, “I’m sorry.” Empathy is hearing someone’s problem and getting down into the trenches with them. “I’m sorry” is feeling for someone, and empathy is feeling with someone. If this sounds difficult, don’t worry! Empathy is something that you can develop over time. My favorite way to feel empathy is to think about what someone’s said, and imagine myself in that situation. What might I feel, say, or do? Of course, doing this too often can be bad for your mental health. It’s important to establish healthy boundaries when practicing empathy to avoid getting swallowed up by the pain of others. Learn more about how to express empathy by checking out our article on empathy vs. sympathy. Depression can make it difficult to accomplish even the simplest of tasks. Because of this, many day-to-day chores get pushed to the wayside. Offer to help with these tasks as you’re able to. Some great ideas include helping them catch up on their dishes, vacuuming, taking their dog for a walk, helping them with a load of laundry, watching their kids for a couple of hours, or offering to accompany them to a doctor’s appointment or the grocery store. These small acts of kindness can make a world of a difference. Plus, a cleaned physical space can do wonders to help with their mental and emotional space. Worried about a friend? 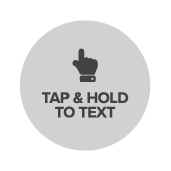 Text a Crisis Counselor at 741741 or use the mobile text button below. Depression can be very isolating. Letting a person struggling with depression know you’re thinking of them and still care about them can put a smile on their face. It’s also a good way to check on their safety. Be okay with no response, sometimes. Your friend may read your message but might not have the mental energy to uphold a conversation. When they do respond, gauge the message to see if they feel like talking. A longer or more detailed message might mean they’re up for a conversation or looking for support, whereas a shorter message suggests they’re not in the frame of mind to chat for too long. It can be frustrating when friend isn’t responding to your messages. After a while, you might even worry that your invitations are creating more stress. Don’t give up on them! Continue to include them in plans and invite them places like you did before. This reminds them that, they still have friends or loved ones that care about them. The important thing to remember is that their rejection of your plans has nothing to do with you. They probably want to join you more than anything, but may lack the energy (mental or physical) to do so. Letting them know they’re cared about and will be missed will mean a lot to them. You could even ask if they’d like you to send them pictures or short video clips from the event or get-together to help them feel more included. On days where your friend feels like getting out, invite them to do something you used to enjoy together. Some examples might be a fun day at a theme park, a relaxing spa day, or a casual cup of coffee. Normality is important for those going through depression. Getting back to things that they used to find fun or stress-relieving can be a great form of self care for people. While we do our best to help our friends in their time of need, it’s important that they have proper resources and outlets when coping with mental health issues. If you’re finding your friend is needing a lot of support, recommend professional help. You could help them locate a therapist, counseling center, or support group near them, and even help them set up an appointment! You can also make sure they have access to a 24/7 resource for crisis moments, such as Crisis Text Line. For a list of resources, check out their referrals page. Lastly, help your friend create a safety plan and identify some coping skills they can use when things feel unbearable. A good safety plan might have three to five people in their support system that they can contact if they feel like they’re in danger, steps to make their environment more safe (or where they can go if they feel they can’t stay safe at home), and coping skills they can use to work through their feelings (such as breathing exercises, exercise, bubble baths, a beloved hobby, etc.). It’s also good to identify their triggers so they can be avoided when possible, and come up with distractions for when they need to just get outside their head for a bit. Are you the friend that people turn to in their times of crisis? Become a Crisis Counselor and use your empathy superpowers to help those in need. The important thing to remember is that depression affects most people at some point in their lives, whether it’s short-term depression as a result of grief or a stressful life event, or long-term depression resulting from life’s stressors (or sometimes, resulting from nothing specific at all). Our job is not to fix a depressed person, but rather, to come alongside them as a support and a friend. Hannah Emmett has been Crisis Counselor with Crisis Text Line since 2015 and also assists with volunteer training as a Coaching Assistant. Her passions include educating about mental health and reducing the stigma around mental illness in the workplace (particularly in military communities). Hannah served as the Chapter President of her university’s Active Minds club while in college and holds a B.A. in education.